One thing is for certain; the #SundaySupper group sure does have it’s finger on the pulse of what’s trending when it comes to food and recipes. With slow cookers and crock pots being *all the rage* (yep, everything old is new again), I chose to make and share my recipe for Slow Cooker Pot Roast and Portabello Stew for this weeks theme of “slowly bringing in the new year”. This Slow Cooker Pot Roast and Portabello Stew takes a little bit of preparation in the morning so you’ll need to plan ahead and give yourself about 15-20 minutes of prep time with the ingredients before you can place the lid on the cooker, set it, and forget it. If you’re lucky enough to be home as this stew cooks away, the aromas you’ll encounter during the day will have you salivating and dreaming about dinner time all day long. 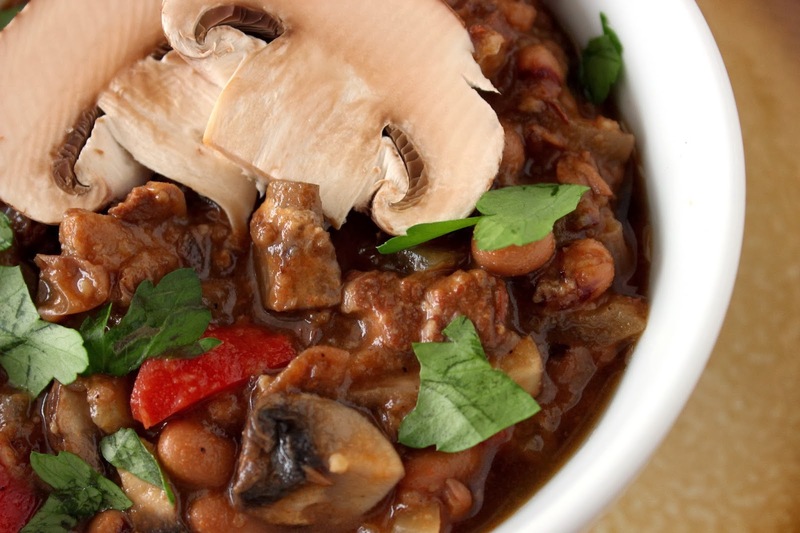 Not only is this stew incredibly delicious, it’s also incredibly good for you with all those healthy portabello mushrooms, red bell peppers, black eyed peas and onions! -In a large zip lock bag, combine the flour, salt, black pepper, garlic powder and ground thyme. -Add the beef into the bag and shake it to evenly coat the meat with the flour mixture. -Remove the floured beef pieces from the bag making sure to sift off the excess flour. -In a large Dutch oven over medium/high heat, add 1 tablespoon of the olive oil and half the floured beef mixture. Cook, stirring occasionally until the meat is nicely browned. -Add the first batch of browned beef into the slow cooker and continue browning the last batch of beef in the remaining olive oil, adding it all into the slow cooker when browned. -Going back to the Dutch oven, over medium/low heat, stir together the beef stock, red wine, tomato paste. sriracha and brown sugar until warmed through and evenly combined. -Add the onion, red pepper, bay leaves and garlic to the beef in the slow cooker. -Carefully pour the beef stock/wine mixture into the slow cooker and add 1 cup of water. -Cover the cooker and set the cooker temperature for either low or high (depending on when you want dinner to be ready). -About 30 minutes before you’re ready to eat, add in the butter and the mushrooms. Stir well and season with the additional salt and pepper. -Spoon the stew into bowls and garnish with parsley if desired. Luckily for me I outgrew my aversion to mushrooms a few years ago and now I can’t get enough of them sometimes. If you’re not a fan of mushrooms, I do believe this recipe will make a convert out of you and I strongly urge you to try it. Mushrooms are so amazingly good for you and have been shown to reduce the risk of breast cancer in woman by 64% if eaten daily. Good and good for you!!! This is the time where I like to do a giant shout out and thank you our wonderful and hardworking host of the week… Thank you so much to Cindy of Cindy’s Recipes and Writings. This was a fantastic theme and very timely of you! 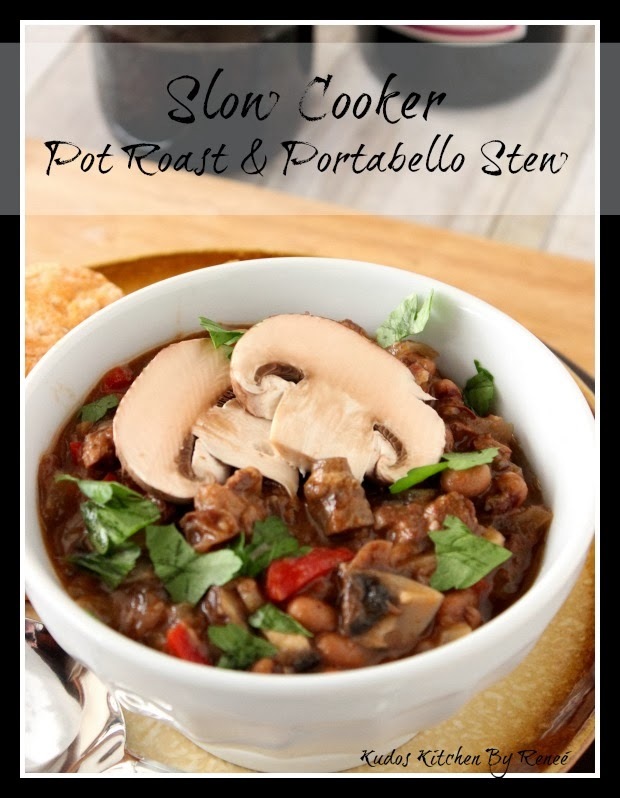 To see all the other wonderful #SundaySupper slow cooker and crock pot recipes, check out the following links. With recipes this tasty, comforting and easy, I promise that you’ll have delicious crock pot recipes to last you the remainder of the winter! 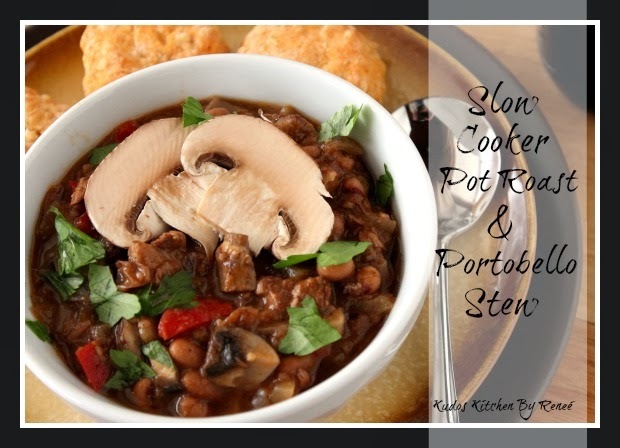 I love the black eyed peas and sriracha addition to your stew, Renee! You had me at portabella mushrooms…I bet the other ingredients are the perfect accompaniment. 🙂 But in all seriousness, the stew looks amazing! Ohhhhh, yum!! I love pot roast in the slow cooker and yours looks out of this world! Nice to find your blog through #SS. This is my first participation and what a great line up of recipes. Your stew sounds incredible. Sriracha and red wine? I'm in!! Mushrooms, a touch of heat, black eyed peas! This stew has it all…delish! I'm like you, I used to have a severe aversion to mushrooms, but I like them now (unless they're raw. Then I just can't deal.) This looks wonderful, I would definitely try it! Mushroom lovers everywhere – UNITE!! I agree with you that mushrooms are GOOD and GOOD! I have never made a beef stew with black eyed peas! How fun it is to see all of the different versions of things to get new ideas of how to make our meals delicious! Thanks for sharing & HUGS! Comfort food at its finest. 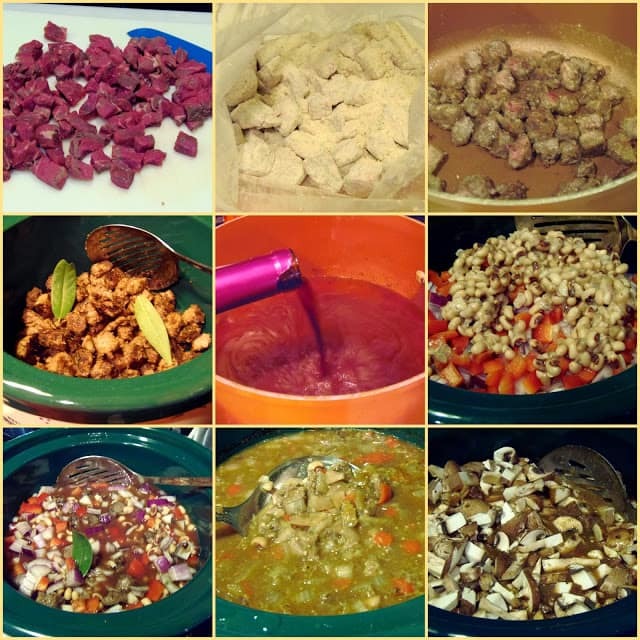 Great looking stew Renee. I love mushrooms! This looks great! I like that it's hearty enough that it could easily be made into a vegetarian stew. What a gorgeous bowl full of happiness. This stew has all sorts of my favorite things in it! Mushrooms, sriracha, bell pepper, and hunks of tender beef? I'll take a giant bowl please! I think we're a pretty trendy group 🙂 Anything with beef and mushrooms is already calling my name, but you added sriracha for spice? Ummmm…I need a huge bowl of this, and soon! This looks amazing! SO rich and delicious. Oh my goodness I am seriously making this THIS WEEK! Yum! Such a good looking stew! Those mushrooms look amazing on top. I agree that one of the best things about slow cookers is getting the chance to smell all the wonderful aromas during the day! I love the aromas coming from a slow cooker and filling your home making you so excited to try the final product!!! Your recipe looks amazing!! Two ingredients caught my eye, the black eyed peas and the portabellos. We use beans and mushrooms a lot, but we definitely don't use these two enough. Beautiful stew!